The music in the café cattycorner from my apartment is American (“Gangster’s Paradise,” when I walk in, and a track from Chronic 2001 after that). I see my first American-built vehicle for the trip (a Ford that doesn’t look like any Ford sold in the States). I see a father and son walking to the park across the street from the café and from my apartment. Son turns to father and asks inquisitively about a game in the park. A man whose job I do not envy navigates a 25-foot truck on a right-hand turn through the narrow intersection, managing the feat in what is perhaps a 9-point turn. Because the weather is reported to be clear through the rest of the day, I meet my friend at 5:30pm in Alexanderplatz. 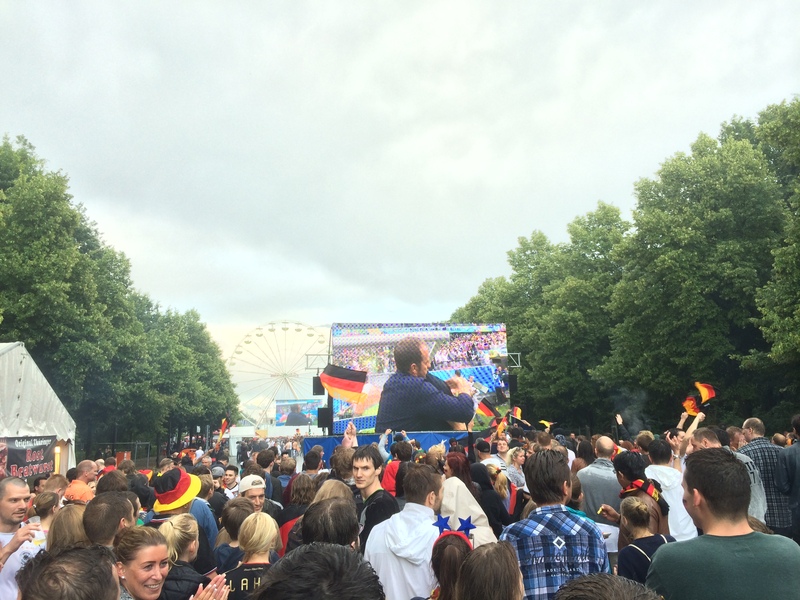 We head toward the Tiergarten for the USA-Germany football match. As we arrive on the southeast end of the park, the police have blocked off the entrance on the east side and most of the entrances on the south side of the park in an effort to control the flow of dozens of thousands of fans. We’ll be late to the kickoff, but worse things have happened and I’m just glad for the company after eight days by myself. I think I hear thunder. “I think I hear thunder,” I remark. My friend isn’t so sure, suggesting that it might be something else. We find our way onto the central thoroughfare through the Tiergarten, and it’s swamped with dozens of thousands of fans drinking bear, eating sausages, and generally enjoying themselves in as orderly a manner as is possible in such circumstances. As we enter the official area known as the Fanmeile, the thunder comes again, and the rain begins. We watch the game and get progressively more soaked. I love it, though – the fans are excited about the game and are generally much better behaved than I would have expected for a soccer-crazed nation at the epicenter of fandom during the biggest sporting event in four years. The U.S. loses this match – no surprise there. What is a sort of surprise is how excited about these games I’m getting. I became a soccer fan of sorts last summer, when I attended something in the neighborhood of 13 or 14 Major League Soccer games. The guys playing for these national teams are just so talented that watching them play is a real pleasure. I used to think soccer terribly boring. At some point last year, I realized that soccer is just grass hockey. The strategies and setups are the same, and so are other aspects of the sports. I’m a fan, now. I shout, cheer, and am on the edge of my seat (or I’m standing) during the games. On the way back toward the U-Bahn station from the Fanmeile, we pass a sign indicating that we’re standing above the entrance to Hitler’s bunker. I have been wondering where that was. 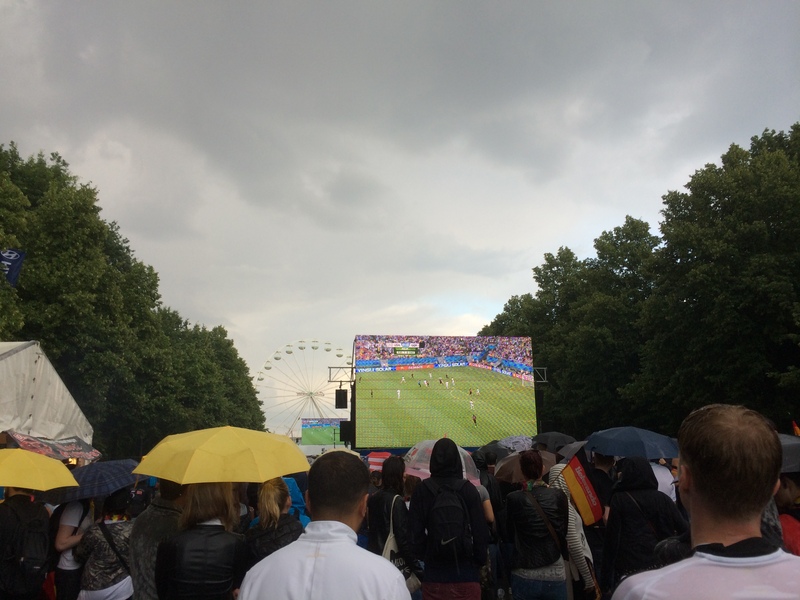 This entry was posted in Travelogue and tagged Berlin, Brandenburg Gate, Brandenburger Tor, Culture, Fanmeile, Football, Fussball, German vs USA, germany, Patriotism, Soccer, Tiergarten, World Cup. Bookmark the permalink.